Born in Geeveston on the 29th April 1909. Married in 1936 and had 3 sons: Barrie, Ian and David. In the 1950’s/60’s sawing was nearly a forgotten art in the competitive arena in Southern Tasmania, mainly due to the lack of racing standard equipment. 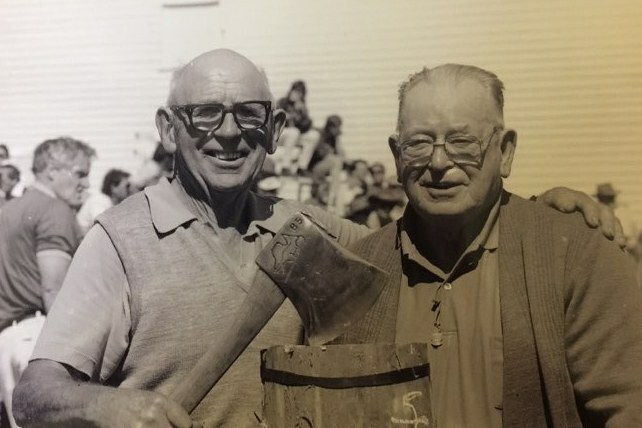 Assisted by the late Edgar Thurley, Bill developed racing saws for competition. Many arduous hours were spent in his workshop preparing these saws for little or no financial gain. His interest led him to investigate the best filing equipment and tempered plates he could locate from Sydney, New Zealand and America. He was always keen to find a better steel and to file an appropriate edge to improve the standard or to suit a specific species of timber. To prepare racing saw for a carnival was a real passion and he was astute in recognising the potential of a junior sawyer and showed willingness to assist them. In 1985 Bill suffered from a severe stroke, but this was where his character and constitution came to the fare. It was with single minded determination that he learn to walk, talk and use his ‘useless’ arm again. However, it wasn’t until he could file a saw again that he was happy with his recovery. He continued to make and sharpen saws and at the time of his death in 1995 had competed over 100. The pleasure he go from the sport and the people involved were his motivation. 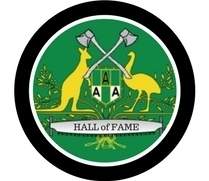 Bill’s involvement has been acknowledged by receiving a Merit Certificate from the Australian Axemen’s Association and an Australia Day Award honouring his service to sport in the local community.